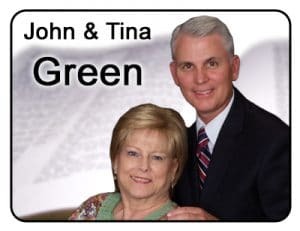 Brother John and Tina Green became representatives for our Printing Ministries on New Years Eve of 2001. Having grown up at Parker, John was well aware of the growth and expansion of all the ministries at our church. His loyalty to his father and pastor, Dr. Don Green, has never been questioned. His love for the Lord and the work of God has been proven through over forty years of preaching, pastoring, and serving in Christian Education, and now the involvement with our printing ministry. The Lord has used the Greens to spread the gospel and raise funds for hundreds of thousands of Scripture portions, Bibles and New Testaments distributed through our Bearing Precious Seed ministry. Their testimony of triumph resounds to the glory of God. John and Tina were married in February of 1974. Nine weeks into their marriage, they were tragically involved in a head on collision by a drunk driver. The accident left Tina paralyzed and in a wheelchair for virtually all her married life. She has labored in the ministry with her husband all these years. She is still traveling with her husband as her health permits. In 2016, Brother John became the director of Printing Ministries at PMBC. He covets the prayers of all who appreciate our work of getting God’s Word into the hands of as many souls as possible. You may contact Brother John Green to schedule a visit to your church to present the various ministries we offer. He will display many bibles published and produced by our church. God has blessed and continues to use Local Church Bible Publishers, and we would love to make these bibles available to your people as God leads.